My husband and I are in the midst of looking for a new apartment in New York City for our family of five. And while it’s a lot easier in some ways than it was 14 years ago, when we last looked, it’s also a lot harder. On the plus side, we love the fact that, with all of the technology at our disposal, we can go to a neighborhood we’re interested in and see relevant listings in seconds. We can see what the owner paid for the property, price fluctuations (if the listing has been available for a few months), floorplans and much more. This vast number of listings, though, has sent me down the rabbit hole for hours, as I adjust neighborhoods, price ranges and more. Adding to the stress is the fact that hot properties can post for just hours. So what have I done to reduce the stress? Most importantly, we know what our maximum budget is so we could set realistic expectations. We set our priorities and deal breakers when we started out, but have remained flexible enough to adjust them as we met the reality of the market. That means we’re no longer wasting time with properties that don’t meet our needs. Fortunately, figuring out how much house you can buy can be the easy part with Capital One Simply Smarter Home Loans. You can get pre-qualified for a loan within minutes and find out what your competitive mortgage rate will be without impacting your credit score. You will be assigned a mortgage loan officer to help you through the process, too. And, you’ll be able to track your progress and upload and sign documents electronically with Capital One’s online tools. Think you’re a smart home buyer? 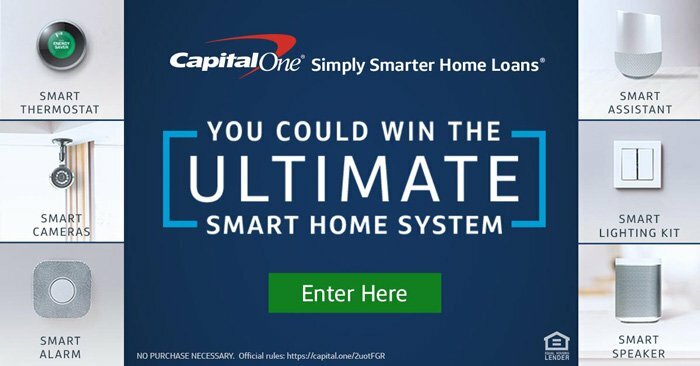 Put your knowledge to the test with Capital One’s Simply Smarter Home Buying Quiz and you’ll be entered to win an ultimate smart home system, with lighting, cameras, thermostat, security features and a smart assistant in Capital One’s Simply Smarter Home Sweepstakes. One Grand Prize Winner and two First Prize Winners will be announced weekly, starting July 10, 2017 and running through August 21, 2017. The Grand Prize Winners will receive one (1) Google Home, one (1) Nest Protect smoke alarm, three (3) Nest indoor cameras, two (2) Nest outdoor cameras, and one (1) Caseta wireless lighting control kit, and a check made payable to the winner for $700 – a total value of $2,785! And, the First Prize Winners will receive (1) one Google Home ($129). You can return daily to increase your chances. NO PURCHASE NECESSARY. Sweepstakes starts 7/10/17 at 12:00 PM ET and ends 8/21/17. Consists of 6 separate entry periods. Open only to eligible legal residents of the 50 United States/DC who are 18 years old and older. Click here for Official Rules and complete details, including entry instructions, entry periods, odds of winning, prize information, restrictions, etc. Void where prohibited. Sponsored by Capital One, N.A., 1680 Capital One Drive, McLean, VA 22102. These opinions are those of the author and not of Capital One. Unless noted otherwise in this post, Capital One is not affiliated with, nor is it endorsed by, any of the companies mentioned. All trademarks and other intellectual property used or displayed are the ownership of their respective owners.